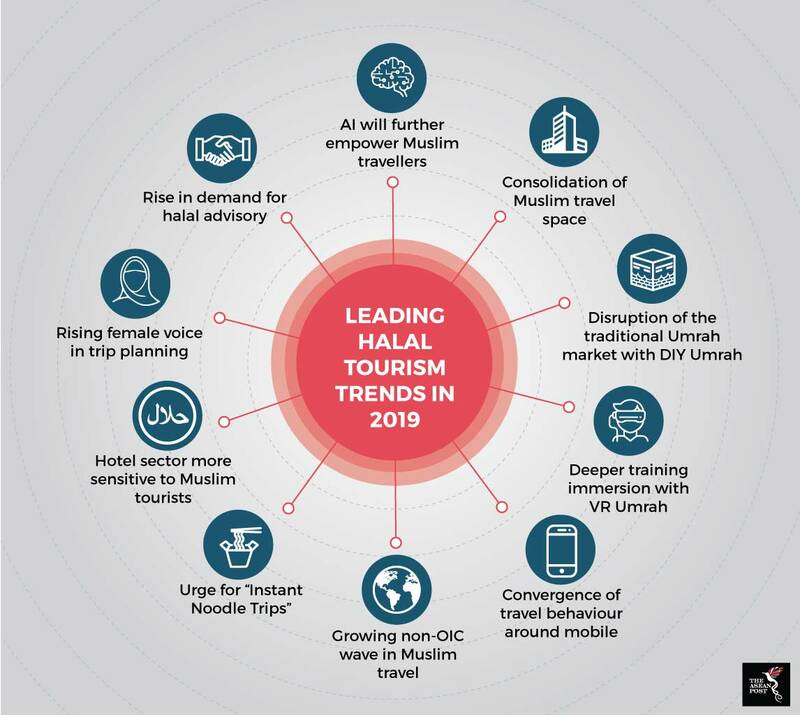 The Mastercard-CrescentRating Halal Travel Frontier 2019 report analysed changes in the halal travel segment and noted how technology is increasingly being implemented by tourists, travel agents and tourism promotion agencies in an industry currently worth an estimated US$180 billion and is expected to reach US$300 billion by 2026. Southeast Asia is forecast to attract over 18 million Muslim arrivals by 2020 - nearly 15 percent of all tourist arrivals to the region. Among the other trends identified in the report include the consolidation of Muslim travel space in the face of more mergers and acquisitions, the disruption of the traditional Umrah (pilgrimage) market – dominated by travel agents – with DIY Umrah, and a growing wave of non-OIC (Organisation of Islamic Cooperation) countries such as Japan, South Korea and Taiwan in Muslim travel. The growth of impromptu short trips decided only a few days before travelling, the increasing influence of women in planning and selecting trips as well as the rise in hotels catering to Muslim tourists were other key trends in the report. The Mastercard-CrescentRating report mirrored findings of the State of the Global Islamic Economy Report 2018/2019, which stated that the digitalisation of halal travel is set to drive the market forward – boosted by the customisation of tour packages as travel companies gain insights from data analytics. Commissioned by the Dubai Islamic Economy Development Centre and produced by Thomson Reuters, the report released last October also found promising investments in digital halal travel apps and websites. The Tourism Authority of Thailand launched the Thailand Muslim Friendly app in 2015 as part of its strategy to market itself as a Muslim-friendly destination. There are several other apps that cater to Muslim travellers’ needs by providing information on prayer times, prayer facilities and halal food options nearby. Among those include Zabihah – which reviews halal dining options and has more than 20 million annual users – and Halal Navi – created by Malaysian IT engineer Rafiq Rahim. The availability of halal food and accommodation ranks high in the list of requirements for Muslim travellers, with research group J. Walter Thompson Intelligence finding that over 70 percent of the Malaysian and Indonesian women in its “The New Muslimah: South-East Asia Focus” survey in 2017 chose their travel destinations based on those two factors. With more travellers looking for a way to connect with a destination’s Islamic heritage, location based AR apps such as Islamic GPS allows them real-time digital layering of destination information with historic sites they travel to – eliminating the need for brochures or travel guides. The proliferation of AI with the use of chatbots is helping assist Muslim travellers to access information 24/7, with machine and deep learning allowing AI to collect and understand information on consumer preferences to better serve them. Singaporean content provider Have Halal, Will Travel (HHWT) last year launched a chatbot named Sofia to help Muslim travellers streamline their decision-making process when planning a trip, allowing users to search for halal food or find prayer spaces. It is used by more than nine million Muslims from Singapore, Malaysia and Indonesia each month. HalalTrip, which promotes itself as the world’s leading online travel platform catering specifically to Muslim travellers and has an app which provides navigation around cities and shows prayer times globally, also has a chatbot – Farah. Singapore is leading the way in VR Umrah and last month came up with a VR experience believed to be the first in ASEAN. Travel agents Shahidah Travel and Tours worked with a VR development company, VR IGNITE, to better prepare 150 Singaporeans for the trip of their lifetime – with VR guiding them on the steps and the rites needed to be observed while on their pilgrimage to the Holy Land before traveling there. Boosted by a technologically savvy population and increased funding for halal-friendly start-ups, the halal tourism industry should be prepared for further disruptions. “Several human service roles will be replaced by more autonomous yet human-like AI service agents capable of providing hyper-personalised service experiences on a large scale. Companies in the halal travel space too are not protected from this disruptive reality and must begin to adapt today."